GL Pannier Mounts for Motorcycle Soft Luggage – now available for pre-order, shipping September 25! 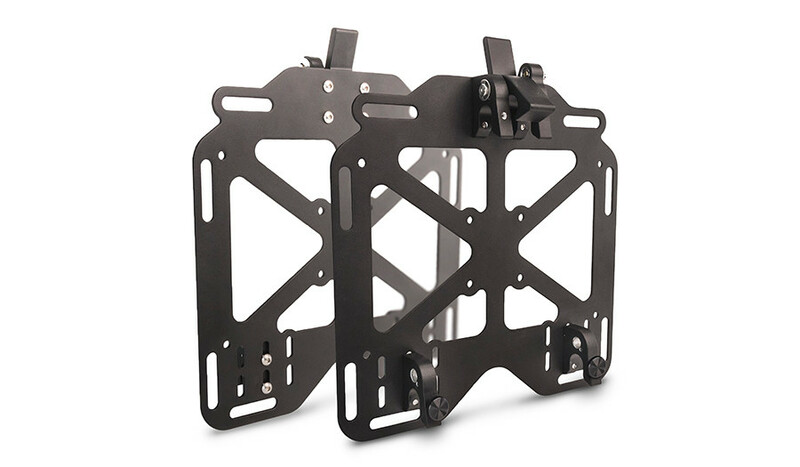 Introducing GL Pannier Mounts for motorcycle soft luggage! Designed in Bend, Oregon by Giant Loop, these ultra light, ultra tough quick release, quick mount, lockable powder coated aluminum plates secure Giant Loop’s Round The World Panniers, MotoTrekk Panniers, RotoPax gas cans and other gear to most side luggage racks with flat, vertical hoops constructed with 18mm round tubing. Examples: Touratech and the BMW R1200GS Adventure’s OEM luggage rack (Giant Loop adapter required for exhaust side of BMW GSA). Other adapters and mounting options available soon. WEIGHS JUST 3.6 lbs. Sold as a set of two, with two keys included. Order now!